Three auger pressure grouted (APG) test piles were constructed at a site in Richmond, Texas. The piles were each equipped with two U-loops of heat transfer pipes so that they could function as pile heat exchangers. The piles were of two different diameters and used two different grouts, a standard APG grout and a thermally enhanced grout. Thermal response tests, where fluid heated at a constant rate is circulated through the pipe loops, were carried out on the three piles, utilising either single or double loops. The resulting test data can be used to determine the surrounding soil thermal conductivity and the pile thermal resistance, both essential design parameters for ground source heat pump systems using pile heat exchangers. 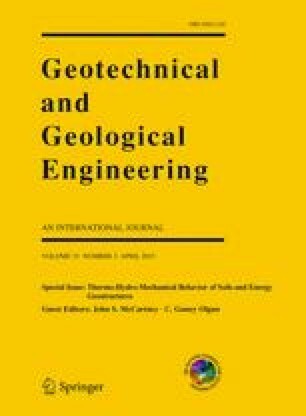 This paper uses parameter estimation techniques to fit empirical temperature response curves to the thermal response test data and compares the results with standard line source interpretation techniques. As expected, the thermal response tests with double loops result in smaller thermal resistances than the same pile when the test was run with a single loop. Back analysis of the pile thermal resistance also allows calculation of the grout thermal properties. The thermally enhanced grout is shown to have inferior thermal properties than the standard APG grout. Together these analyses demonstrate the importance of pile size, grout thermal properties and pipe positions in controlling the thermal behaviour of heat exchanger piles. This work has been carried out with support from the UK Engineering and Physical Science Research Council (research grant number EP/H049010/1). The second author was supported by the U.S. National Science Foundation under grants No. CMMI-0928807 and CMMI-1100752. The authors would also like to acknowledge Berkel & Company who funded the field testing and Jim Shaver who collected the test data.